After just over five weeks of spring action and competitions, the Twins made final moves to complete their Opening Day roster. Five competitions in all have now come to a close, and the Twins will play three more spring games to prepare for their first test in Los Angeles next week. Gone from the competition and the list this week is catcher Wilson Ramos, infielder Matt Tolbert, outfielder Jacque Jones, and pitchers Glen Perkins, Mike Maroth and Anthony Slama. Opening Day 2010 is days away, and a new era in Twins baseball is coming right with it. Butera didn’t hit well this spring (.154 in 17 games), and he shouldn’t be expected to hit well during his stay up north. While Gardy seemed to like Wilson Ramos and his bat (.400 in 13 games), experience almost certainly was the deciding factor in brining Butera to the majors until Jose Morales is healthy. Alexi Casilla (IF) Three players were up for the final bench spot, and Alexi Casilla came away with the spot seemingly by default. Jacque Jones hasn’t played in the majors in over a year, and Matt Tolbert had one option remaining. Despite a poor spring (.128 in 21 games), Casilla makes the team mostly because nobody stepped up to beat him, and partly because he would have been with another organization otherwise. After pitching extremely well this past winter, Liriano seemed to take control in the competition for the final spot in the rotation as spring training began. While his competition for the spot wasn’t the best over the past month, Liriano would have been tough to beat with his performance: 6 games, 20 innings, 6 runs, 5 walks, and 30 strikeouts. Brian Duensing played a major role in the team’s success to close out the 2009 season. He struggled early on this spring, but his final outings were better and he’ll be a second left-handed option and long reliever out of the bullpen. Duensing ended his spring with a 4.50 ERA in 16 innings pitched. Pat Neshek (RP) Pat Neshek hadn’t faced live hitters in over 14 months when spring training began, and it seemed very likely that he’d get some extra work in through either extended spring training or minor league games before joining the Twins in Minnesota. Joe Nathan’s injury, combined with Neshek’s success on the mound (1.86 ERA and 12 strikeouts in 9.2 innings) put him on the Opening Day roster and in line to return from Tommy John surgery officially in April. For the past 28 years, the Minnesota Twins have been located under the roof of the Metrodome on the other side of town. In just a few days the month of April will roll around, and the new month will signify the beginning of a new era with the opening of Target Field. This season, there will be wind, there’ll be rain, and there’ll be sun. 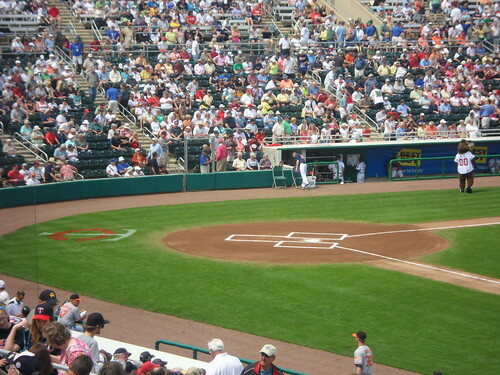 Beginning in 2010, weather elements will combine with baseball once again in Minneapolis. The team’s new ballpark, Target Field, looks great in photos and on television, but neither of those things can do the ballpark justice. Last weekend, the Twins hosted an Open House to show off their new gem, and the first sight of everything is stunning. All around Target Field are small touches that make the ballpark unique and one-of-a-kind. From the “Gold Glove” on the plaza, to the celebration sign in centerfield, to the Budweiser Deck, to the large scoreboard in left center, Target Field has several features exclusive to the team and found nowhere else in Major League Baseball. Inside there are heaters all around the concourse. 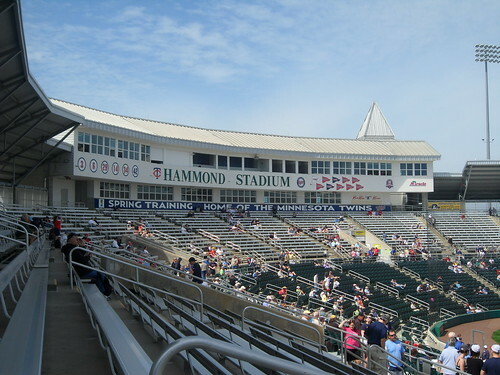 The concourse itself is open from end to end, allowing fans to get their hotdogs and still see the field. There are restaurants: Hrbek’s and The Townball Tavern. The team’s history is displayed across the facility, and the walls are covered all around with photos of both players and big moments. Season ticket holders will be in store for even more. The Metropolitan Club offers a place to hangout, the Legends Club has atriums of both Kirby Puckett and Rod Carew and also is home to “Club 573” for Harmon Killebrew. Describing the stunning new ballpark in small detail and showing the pictures below from the event won’t come close to doing what a trip to Target Field will. When fans walk into Target Field for the first time in this 2010 season, they’ll be able to see the stunning and unique features and details for themselves. The final two weeks of spring training have arrived, and the races are heating up. All around, there seem to be deadlocks. At catcher, there is still no favorite to be Joe Mauer’s backup, the infielders fighting for the final bench spot are struggling, and there seems to be uncertainty in the team’s plans for the bullpen. Can guys like Mike Maroth or Anthony Slama sneak into the race down the stretch? Who might have the slight advantages in the seemingly deadlocked competitions? Who might pull away before the team breaks for two exhibition games at Target Field next weekend? Wilson Ramos (C) Through nine games and 22 total at-bats, Ramos has excelled. He’s seemed to be serviceable behind the plate with a strong arm, and the youngster is currently hitting .364 on the spring. Despite a lack of experience in the highest minor league level, Ramos seems to be getting a real shot from manager Ron Gardenhire to make the roster. Drew Butera (C) Butera has played in 12 games, but has fewer at-bats than Ramos nonetheless. In 18 at-bats this spring, the defensive-minded Butera has only a .167 batting average. It’ll be interesting to see if Butera’s experience help put him on the plane to Minneapolis next weekend. Alexi Casilla (IF) With even a decent spring, Alexi Casilla would be running away with the final bench spot. Instead, in 13 games and 18 at-bats, Casilla is hitting just .143 with six strikeouts. The one thing that may help him make the team and remain with the organization is his lack of options remaining. Matt Tolbert (IF) Since Matt Tolbert is struggling both at the plate and at times in the field, and since he has one more option, a deadlock in the final bench spot competition would almost certainly go to Tolbert’s competitor, Alexi Casilla. Unless he has an outstanding final two weeks, Tolbert seems to be headed to Triple-A Rochester to start the season. Jacque Jones (OF) Jacque Jones is getting ample playing time, and he’s taking advantage. In nine games this spring and a total of 22 at-bats, Jones is hitting .318 with decent plate discipline. It’s still a long shot for Jones to make the club, but it seems as though he’ll secure a spot at Triple-A Rochester. Francisco Liriano (SP) As spring training kicked off, the general feeling was that if Francisco Liriano pitched anywhere near the way he did this winter, he’d run away with the final rotation spot. Liriano is doing just that. In 10 innings, the lefty has allowed just three runs (2.70 ERA) and struck out 16 hitters. With almost complete certainty, Liriano will begin the 2010 season as the team’s fifth starter. Brian Duensing (SP) Despite some struggles and Liriano’s strong outings, lefty Brian Duensing still has a great shot at cracking the Opening Day roster. There are now two spots open in the bullpen with closer Joe Nathan’s injury, and Duensing could be the team’s second lefty if he can beat out Glen Perkins. Their numbers are nearly identical, so heading into the final weeks there is still time to shine and capture a roster spot. Glen Perkins (SP) Perkins has run into a minor injury and will miss a few days on the mound. Those days are potentially precious as he’s currently locked into a race with Brian Duensing. So far, along with Duensing, Perkins has a 9.00 ERA in seven innings. Pat Neshek (RP) At the start of spring training, it seemed as if Pat Neshek was primed for a start in either extended spring training or the minor leagues. He hadn’t pitched to hitters in over 14 months and needed to work back into game condition. Joe Nathan’s injury has opened another spot in the bullpen, and strong outings may give Neshek a better opportunity (although it’s still very possible he starts somewhere other than Minnesota). In six outings and six innings, Neshek has allowed one run (1.50 ERA) and struck out seven. Mike Maroth (RP) It’s very hard to see Mike Maroth making the team out of spring training, but with decent outings, combined with the struggles of both Duensing and Perkins, he may have a small chance to sneak into the race down the stretch. In five games, Maroth has thrown seven innings, allowed three runs (3.86 ERA), and struck out one hitter. Slama (RP) Anthony Slama has shown fans why there is excitement surrounding his name. Through four innings, the young righty has been nothing short of dominant. He’s allowed no hits or runs and struck out eight. He’s not on the 40-man roster (though he could take Nathan’s place when he heads to the 60-day disabled list) and has thrown mostly to non major league players with his late-game appearances, so he appears to be a long shot despite his success. Nonetheless, he should debut sometime in 2010. Target Field will end indoor baseball in Minneapolis, and it may too end the use of the moniker “cheap” in relation to the Minnesota Twins. After trading for J.J. Hardy, retaining Carl Pavano and signing stars Jim Thome and Orlando Hudson, the Twins put the finishing touch on their busy off-season Sunday night, locking up their hometown hero through 2018. Joe Mauer is a rare breed. At the age of 26, he’s won three American League batting titles, three more than any American League catcher in baseball history. His .365 batting average last season is the highest by a catcher in baseball history, and he also became the first catcher in history to lead the American League in batting average, slugging percentage and on-base percentage. His eye-popping numbers in 2009, which came even after he missed the first month of the season, earned him a third Silver Slugger award, and helped him join teammate Justin Morneau as an MVP award winner. Mauer’s busy off-season has now collided with the Twins’ after months of negotiations, and the result is an 8-year, $184 million contract. 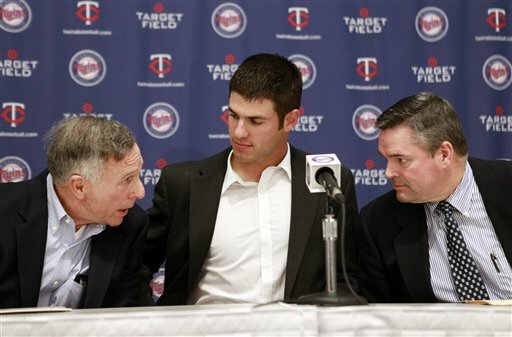 For the next nine seasons, and through the age of 35, Mauer will be with his hometown team in Minneapolis. The months filled with false rumors and false hope are gone. No longer will Mauer need to talk about where he might be after the 2010 season on each road trip. Instead he can answer questions about staying with his hometown team and his attempts at taking the team he grew up rooting for to a World Series. In the early years of the long contract, if Mauer continues to progress and produce, fans will praise what is now the fourth largest contract in baseball history. In the later years, if Mauer regresses or struggles at times in his mid-thirties, there may be some grumbling. Yes, the long term deal carries its risks. Paying a 35 year old catcher $23 million might not work out. Then again, who says Mauer couldn’t change positions over the course of nine years if necessary? The Minnesota Twins had no option but to fork over the money, and in the end, it’s a deal that seems fair for both sides involved. Had the Twins lost Joe Mauer after just one more season, fans would be wondering for the next decade, what might have been. There will be no need for those thoughts however, fans will be able to find out the fate of the contract with a front row seat. Week three of Making the Team brings with it only minor changes. There is still no favorite in the backup catcher competition, no infielders are stepping up to take the final bench spot, and it seems as though manager Ron Gardenhire is leaning toward Pat Neshek starting the year in either Triple-A or extended spring training. Wilson Ramos (C) Ramos has hit well in 15 at-bats, posting a .400 batting average through six games. His defense seems to be serviceable, and it seems as if the Twins are giving Ramos a strong opportunity to compete with Drew Butera for the backup catcher role until Jose Morales can return. Drew Butera (C) Butera is going to need to beat Ramos with his defense and experience, because his bat isn’t anywhere near being flashy. Thus far, in only 12 at-bats, Butera has a .167 batting average. Danny Valencia (3B) Danny Valencia will almost certainly be in Minneapolis at some point during the 2010 season, but it seems highly unlikely that he’ll be there when the team opens Target Field. With ample playing time thus far, Valencia has hit .286 in 14 at-bats and 8 total games. Alexi Casilla (IF) Alexi Casilla has had a difficult spring at the plate, hitting just .111 in nine games. The Twins have given him ample at-bats (18) nonetheless, and he seems likely to make the Opening Day roster with no options remaining and his fellow competitor providing even less production. Matt Tolbert (IF) Matt Tolbert’s current situation is simple: He has one option left and a trip to Triple-A seems likely. In 14 at-bats, Tolbert has no hits, and his defense hasn’t made up for a lack of plate production. He has made several defensive mistakes too. Jacque Jones (OF) It’s hard to see Jones making the team out of camp, but with both Casilla and Tolbert playing poorly, there’s a chance. If the Twins are comfortable having one less infielder and Jones hits well in the final weeks, his chance could become a reality. Francisco Liriano (SP) Francisco Liriano continues to pull away with the final spot in the rotation with every spring appearance. In seven innings, Liriano has surrendered a few runs, but has walked only one batter while striking out 12 hitters. The closer role remains a possibility, but if he’s good enough for that role, he’ll serve the team better as a starter. Brian Duensing (SP) Only one lefty is currently in the bullpen, and with Nathan’s injury, another spot may now be available. If that spot remains open, Brian Duensing seems like a likely candidate to take a spot in the ‘pen and serve as an additional lefty and the team’s long reliever. Glen Perkins (SP) Perkins has thrown 3.1 innings, given up 8 hits, and allowed 5 earned runs so far this spring. It isn’t quite the performance the Twins were hoping to see, and he isn’t doing the best job of showcasing himself for other teams. It’s hard to see him making the team with other candidates seemingly being better options, but it’s still possible. Pat Neshek (RP) Neshek has thrown four solid, scoreless innings so far. Nonetheless, Gardenhire seems to be leaning toward Neshek starting in either Triple-A or extended spring training with his comments. Neshek hadn’t thrown in 14+ months and his velocity could still increase. Mike Maroth (RP) As stated before, Maroth will begin the season at Triple-A with almost complete certainty. His spring outings will continue to build his case for potential injury situations during the 2010 season. Slama (RP) Anthony Slama could potentially make the bullpen if the Twins don’t bring in another closer and Neshek begins the season somewhere other than Minnesota. Even if he doesn’t make the team however, he’s likely to make his debut this season, and his spring outings, much like Maroth’s, will build his case. One of the most unique features that fans will notice when they step foot inside Target Field this season is the celebration sign in centerfield. There is now footage of the sign, which features Minnie and Paul, in action.